1. Clean the fish pieces well in salted water. 2. Grind chilli powder, turmeric powder and fenugreek seeds to a paste with 6 garlic cloves and 1 tsp ginger and keep aside. 4. Splutter the mustard seeds. 5. Add onion, remaining garlic, ginger and curry leaves. 6. Keep stirring and when it turns slightly brown drain from oil and keep aside. 7. In the same oil, stir in the ground masala and fry until the aroma arises. 8. Add the soaked cocum and 2 cups water. 10. Transfer this into an earthenware vessel and simmer. 11. Gently ladle in the fish pieces and the sauted ingredients. 12. Cook half covered, till it boils. 13. Remove the lid and allow to simer on low heat till the gravy thickens and the fish is cooked. 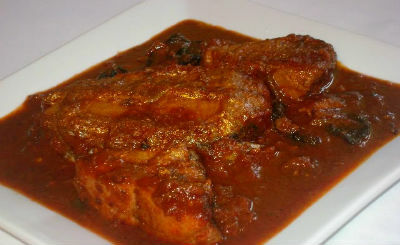 Feel free to comment or share your thoughts on this Meen Vevichathu (Red Fish Curry) Recipe from Awesome Cuisine.